Three items, all belonging to O.T. Foote, of Franklin NY. Receipt for payment into membership of The National Creamery Buttermakers' Association. Dated 1911. Membership card, Franklin Lodge. Dated 1910. 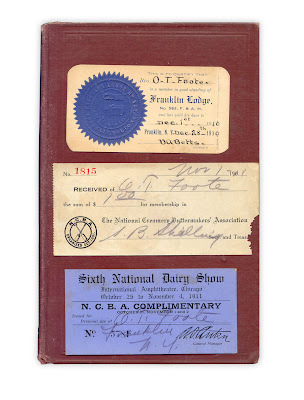 Admission card for the Sixth National Dairy Show, Chicago Il. Dated 1911. Found in "State of NY - Department of Agriculture Report of Farmers' Institutes" by Raymond Pearson. Published by J.B. Lyon, 1909. Hey hey - what a connected gentleman. Great one! "I was raised on the dairy!" Wonderful! This is the stuff of a clear touch with history. Love this Blog! Looks like he joined the Buttermakers while at the Dairy Show. Good marketing and outreach, Buttermakers!